Yesterday we released the 14th Ultimate Credit Card Portfolio on Rewards Canada. This one is the Ultimate Foodie Credit Card portfolio! 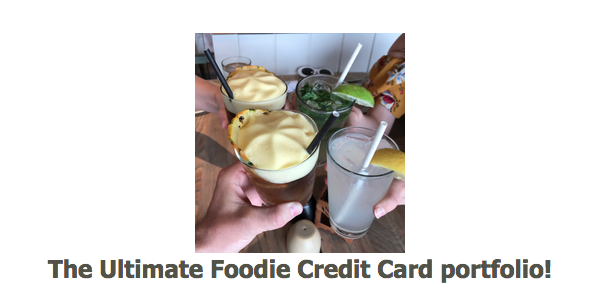 In this feature of Rewards Canada's Ultimate Credit Card Portfolios we look at the ultimate one for those who like to enjoy food - whether it is cooking your own gourmet meals or going to three Michelin star restaurants. And when it comes to food - you buy it - no matter what so if you a major foodie you'll want to make sure you capitalize on those food purchases by maximizing the rewards you earn. So while this piece is focused on earn we also take into account what those points or cash back can get you. As we have always recommended and is standard with our Ultimate Wallets is that you should carry a Visa, a Mastercard and an American Express card in your wallet. The reason why is that there are benefits, promotions and earning potential unique to each brand of credit card regardless of the version of the card you have. We won't go into detail here as you can read all about it in our feature on how to Maximize your Miles and Points but here we outline one card from each brand that will help you as a foodie get the most bang for your buck. Ultimately there are various options that could be utilized for such a portfolio but we look at one card from each issuing family that we feel are the best fit for foodies. Find out what the ultimate portfolio is here! Find all our Ultimate Card Portfolios here!